You're sitting at your desk contemplating a call you just received from the Director of Dept. "A". "We have a problem," you heard from the other end of the phone, "One of our managers is really struggling to get the production out of his team we need. It seems as if no one really wants to work with him. What can we do? We need this fixed now. Isn't there a training or something we can send him to?" As you think through the conversation, you let out an audible sigh, "Here we go again." This seems to be a continual challenge and not just with this department, but a few others. You think to yourself, "We've sent a few managers to off site management seminars, but for sure we've not seen the substantial, meaningful skill development we really wanted. Clearly something needs to change." 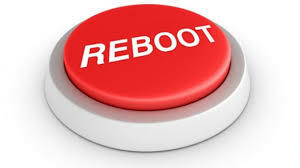 Yes, in fact something really does need to change -- it's time for a reboot! Many of us have experienced being at our computer when it becomes clogged and stalled from all the activity we've done -- to the point it's barely functioning. In some cases, the only way to clear the activity so that it can function properly again is to reboot. That's the way I feel about talent management -- particularly in the area of training and development. We need to clear out the way we've been doing things and come at it fresh. We all know the scenario shared above is very common for many in our industry (human resources) and for the leadership of our companies. And when I say we really need to reboot, I say that with deep conviction and a bit of frustration. I've been in this industry for many years and have observed the same approach and type of thinking to those kinds of phone calls. It must stop! This is a desperately needed leadership / decision-maker competency. (When I reference decision-maker, I am including anyone who is responsible for making decisions in managing talent and approving the funds to do so.) This competency I consider the ability to adequately diagnose and prescribe the appropriate procedures/tools/resources to effectively and profitably address the concern. What's unfortunate is most don't know how to and/or have been trained to see learning or "miscellaneous training resources" as the only solution or prescription because that's what they've been exposed to -- that's all they know. It's a huge perpetual bad practice in our industry! The challenge is compounded when leaders outside the human resource department rely on the department to "have the answers". They see them as the human management experts. In many cases it truly is the blind leading the blind. "In so many cases a training or "bandaid" is prescribed when surgery is what is truly needed." This reminds me of one of my favorite quotes from Abraham Maslow, "If you only have a hammer, you'll see everything as a nail." Many human resource departments and desision-makers are only functioning with a hammer, "Let's send them to a training or create a e-learning course." So much money is wasted because of the inability to adequately diagnose what's happening in our organizations and prescribe appropriate solutions, exacerbated by not embracing effective options. Money is thrown at problems without properly understanding them. This practice is extensively described in Chapter 11 of the book Working With Emotional Intelligence, by Dr. Daniel Goleman. Tweet: Money is thrown at problems without properly understanding them. With all this in mind, here are a few key tips to address this and a video recommendation that further explains them. 1. Determine if there needs to be knowledge gained or behavior changed. Sometimes learning something new, gaining knowledge about a certain topic is absolutely necessary and a learning seminar, workshop or e-learning module is a good way to achieve that -- or it's a good start. If on the other hand behavior change is desired, a capability that needs to be gained or skill developed please know that this will require more time, commitment and both personal and peer attention. This is best achieved via individual and/or group coaching in conjunction with acquiring relevant knowledge. In our practice, we call this approach coaching roundtables (integrated, experiential training -- learn more here) Achieving desired behavior change must include constructive accountability over a period of time. 2. Check your learning to application ratio in terms of attention and spending. Do a review or audit of how you/your company have approached learning and development this year. Has there been more time, attention, planning and money applied to the learning piece vs. the application side? For most companies this truly is an out of balance ratio. I'd say 90/10. At minimum it should be 50/50. With my clients we look at 40/60 or 30/70 (attention to application should be equal to or more than the learning side). This may vary depending on timing, need, subject or skill. Important point: Being capable precedes being skilled. A skill is not necessarily something one knows how to do, it's something one knows how to do well... and that takes time! One can be capable of something without necessarily being skilled at it. As our industry continues to evolve to meet the new challenges in our 21st economy, we must take a step back, approach our work from a fresh perspective and absolutely stop the perpetual bad practices that have been going on for years in this area. How we work with training and developing our talent must change!